You never know when you might need the skills of knowing how to cook & eat live lobster. If live lobsters arrived at YOUR front door, would you know what to do? It really is quite easy once you learn the technique. Come into my kitchen as my friend Iris shows me the ropes. If you think that knowing how to cook whole live lobster is a skill that you’ll never need, you might want to think again. I felt that way until my husband Zane placed a huge box of live Maine lobsters on our kitchen floor and asked me if I could cook them for dinner. (Yikes!) The answer was no (I had neither the know-how nor the necessary equipment), but I had a savvy friend who came over and saved the day. I called upon my friend, chef and culinary expert Iris O’Brien, to come and help me prepare and serve the lobsters to our families. We not only had a marvelous time learning how to cook lobster, but we also enjoyed a feast that would have cost a fortune at any restaurant! 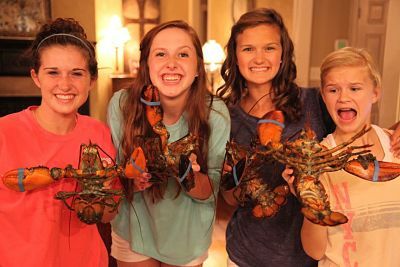 How did we end up with live lobsters to begin with? It was actually a surprise thank you gift from a wonderful couple~clients of Zane~ who wanted to send our family a celebratory meal. They sent us an entire lobster feast (lobster, filet mignon, crab cakes & clam chowder) to serve 12! What an amazing gift for anyone who loves food. Maine lobster is the best there is, and to enjoy it fresh in one’s home is a rare and delightful experience. Thanks to The Lobster Guy, anyone can enjoy live Maine lobster, no matter where they live. Tim Handrigan, lobster fisherman seen on Discovery Channel’s “The Deadliest Catch,” ships freshly caught lobster to customers all over the U.S. The Lobster Guy ships all sizes, price ranges, and assortments of lobster, chowders & bisque, crab cakes, filets, and more. Anyone looking for a unique and extravagant gift might want to consider the gift of live lobster. What a treat! Check out the video below that shows us preparing the lobsters. At the end of the clip, you’ll see how to properly and easily remove the lobster meat from the shell. Note: In the video, I state that clarified butter is the same as ghee. Although there is a slight difference between clarified butter and ghee, for most practical purposes, they are the same. David Lebovitz’s How to Make Clarified Butter is an excellent post on how to make, store, and use clarified butter. Also, my pronunciation of ghee in the video is definitely the Southern accent version. To be accurate, ghee is technically pronounced GEE (with a hard G). For specifics on how long to cook lobsters per pound, very detailed information can be found on The Lobster Guy. The basic method that we followed is below. 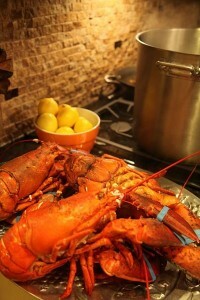 For each 1 1/2 pound lobster, place 2 quarts of water in a large stockpot. Add 2 tsp sea salt for each lobster. Add lobster head first to boiling water. Cover pot; reduce heat to simmer. Keep a low simmer until lobsters are bright red. Remove from pot; allow to rest several minutes before serving.